For the region, see Germany (region). Germany is a formable nation that can be formed in Central Europe by anyone with a Germanic culture (that is not Austrian, Dutch, Flemish or Swiss) as their primary culture once they meet certain requirements. 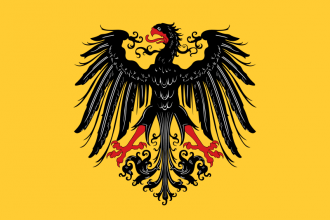 Like the Holy Roman Empire, the nation forming Germany will pass its ideas on to the new nation; for example, if Brandenburg or Prussia formed Germany, the country would retain the old Prussian ideas and traditions. Historically, Germany, or the idea of a unified German state (aside from the Holy Roman Empire) wasn't conceived of until after the Napoleonic Wars. However, the Germany portrayed in EUIV's timeline is more of the German Confederation as the successor to the Holy Roman Empire rather than the modern state of Germany. Provinces in orange must be owned and cored to form Germany. One red province must be owned and cored. Shaded provinces are permanently claimed after formation. Form Prussia as soon as possible. Prussia is an ideal candidate for forming Germany because of their militant ideas and government. See the Brandenburg and Prussia pages for strategy on starting. Note that Poland will most likely have taken Königsberg (41) from the Teutonic Order so it is a good idea to ally Poland's rivals to obtain the province. Once Prussia is formed, the player should improve relations with Austria to form an alliance with them. If not Austria, the player should ally France or a strong non-Germanic country. For instance, Denmark (Or Sweden if they overthrow and are stronger than Denmark), Muscovy, Hungary, or even Ottomans. The player should use his/her discretion to choose allies. Austria may be the most critical alliance because they are frequently Emperor and are in the best position [aside from Prussia] to unite the German States, meaning if they go to war, Brandenburg [Prussia] would want to join them and control as much enemy territory as possible to prevent Austrian coring. However, Bohemia also has a high chance of winning the electorate. If that is the case, an alliance with Austria is key to get Bohemian land. 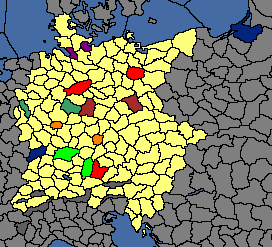 With a strong alliance, the player should begin to eat up North Germany, specifically gaining territories that lead to the provinces necessary to form Germany. For instance, Prussia should work their way through the Saxony regions to get to Brunswick (57), Thüringen (63), and Hessen (81). Prussia should continue with direct lines to the significant provinces until all are under control. It will not look organized, but is an efficient method. It is important for the player to pay constant attention to heir-less German states that can become possible vassals. This allows for acquiring land without worrying about aggressive expansion, but only if the subjugation is caused diplomatically. This page was last edited on 4 March 2019, at 13:50.